The newspaper men and photographers fell in love with the wrinkly moon-faced cowboy named Benny Binion, playing host at his Horseshoe Casino, the literal grandfather of a new poker tournament called the World Series of Poker, shaking everyone’s hands. It was the way he talked and the way he moved. He had credibility as a real Texas operator, a genuine person in a world of fakes and schemers. Although, earlier in his life, the media attention nearly got him killed several times, things have changed so drastically he paid for the media’s airfare to cover his WSOP. If Nick “the Greek” Dandolos was the Prince of Vegas in those early years (a man who would “put a snake in your pocket and ask for a match”, Binion said), then good old Lester “Benny” Binion was the saloon owner who only pretended to be dumb when, in fact, he was, most often, the smartest man in the city. And if someone wanted to argue, Binion didn’t keep snakes in his pockets. Just ask the ghosts of Frank Boldin and Ben Frieden, both who lost their lives when Binion pulled a trigger. Yes, those same hands that welcomed all those news people and the countless number of guests who spilled into the Horseshoe for all those decades with Binion at the helm, put two men into the Texas ground for two different reasons. A decade later, Binion’s hands buttoned the heavy wool winter shirts issued by Leavenworth prison and carved toothbrushes into shanks just in case, because they don’t allow prisoners the luxury of a .38 snub-nose pistol. Like Al Capone, he was sent to prison for tax evasion, but unlike Capone, he got out and built an incredible life in Las Vegas, maybe the only city in the world that would allow it. For a man who, in another life, might have been a Cowboy poet with a harmonica in his pocket rather than dangerous metal, it was his true home town. Born in Pilot Grove, Texas, in 1904 to a father who was a horse trader and stock raiser, Benny suffered chronically with pneumonia. The population of Pilot Grove, located about 60 miles northeast of Dallas, was 193 that year. It was mud and dust and horseshit and muleskinners and gamblers and cheats. So he took his little boy on a late-fall cattle drive, it seemed, to abandon him to the elements or force him to buck up and survive. But the get-tough-or-die strategy seemed to have worked. When improbable things start to happen to people, the improbabilities seem to multiply. Benny Binion didn’t go to school, he traded horses (imagine a 10-year-old cowboy horse trader today) and hustled among the ranchers, trappers and farmers. He noticed they liked to gamble an awful lot. During World War I, Benny worked for a company dealing mules to the U.S. Army. He was the guy who could tell just about everything there is about a certain mule by looking in their mouths. It’s like he didn’t have a childhood. He literally had to learn how to read animals in order to survive. After that, and with Prohibition beginning, he turned to bootlegging. He told Glass that bootlegging got him nowhere. Every time he’d get ahead, something disastrous would happen, he said. That included two stints in jail, one sixty-day sentence and one of four months, and that scared him enough to get out of the liquor business. What Happens When you Bring a Gun to a Knife Fight? At least that’s what happened to Benny after he rolled off a log and shot Frank Boldin in the neck. Boldin, a man with a reputation for sticking people, never pulled his knife. Binion accused Boldin of stealing whiskey from one of his joints in 1931 and an argument escalated. Boldin’s terrible reputation calculated into Binion’s suspended sentence. His policy joint led to a gambling franchise spread throughout the Dallas/Fort Worth area. His operation would rent a suite of hotel rooms and set up card and dice games. The cities were bursting with wealth and the richest not only like to gamble, but liked to gamble high. Benny maintained control of the illicit gambling industry and stayed out of jail with the help of a sheriff who saw no problem with a vice operation, as long as he was getting a cut. With hundreds of thousands of dollars wagered monthly through Benny and his crew, the graft wasn’t small change. 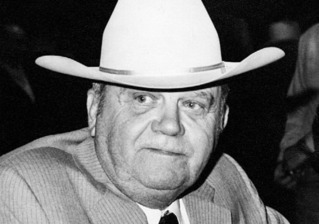 Binion’s great skill in Dallas was negotiating with men in power. He obviously had a very large dowry in which to pull from, but getting those policymakers on his side required more than cash. And even with the dozens of men he greased, his operations still were busted, mostly for show. He estimated that he paid around $600,000 in fines annually. He then pulled out his own piece, a .38 Terrier, and ended Ben’s life. The incident was considered self-defense. In less than five years, Binion had killed two men and was operating in one of the riches markets in America. His reputation as The Cowboy raged and people who you don’t want to, started to notice. He managed to keep on top of gambling business until around 1945, when a number of Binion’s Texas associates and rivals began shooting each other and planting bombs in each other’s cars. And, as if the kitchen wasn’t getting hot enough, the sheriff Binion had in his pocket lost the election. Suddenly, within a year, he became a sitting duck in a sea of madmen. He never went anywhere unless he was armed for a bear hunt. And if that wasn’t enough, he was also being investigated for evading federal taxes, ala Al Capone. Considering the circumstances, he packed his stuff, which was mostly piles and piles of money – how much, Benny claims he didn’t know – and headed to Nevada in 1946. The taxman did eventually catch up to Benny and he pleaded guilty to tax evasion in 1953. He reported to Leavenworth prison on Dec. 21, of that year and served a little more than four years. By 1957, he was back in Vegas and about to change the city forever. This should be required reading for all the people who are capitalizing on the incredible feast that Benny, Jack and a few Texas road gamblers created for them. The players of today are standing on the shoulders of giants who paved the way. Take the time to learn the history of how you came to have the opportunity that you have today. You would have had to have lived the life of a professional poker player at that time to understand that he and his small band did in fact "cure cancer", that is the stigma that was associated with playing poker at that time. Texas,that is silly. This is an interesting read but he was a killer, way more than two, tax cheat, card cheating bookie. Don't make him out to be anything more. he gave the best comps.